In the last blogpost we reflected on the fact that social media platforms in some ways have become the new archives for (social) digital photography for numerous people and discussed the consequences of this notion for the heritage institutions. A question relevant for the Collecting Social Photo project (Cosopho) is: How can the traditional memory institutions, archives and museums, position themselves in this arena in a period of time, where the social media platforms delete data? One reader’s reaction to the blogpost was: “What do you expect?” (of the social media platforms.) In other words, how can the users (and we) be so naïve to trust the platforms as archives? Again it is necessary to distinguish between experienced knowledge and perceived knowledge. To illustrate practice: Sarah Day Thompson from the British Digital Preservation Coalition (DPC) reminds the readers in a recent blog post with the title: ”Save Your Social Media: a quick ‘how-to’ for downloading your valuable photos and content shared online ” that preservation should be done by themselves on a regular basis, if they want to be sure to keep their data. Thompson also reminds us that social media platforms as Flickr, Facebook, Instagram, Twitter, LinkedIn, YouTube and other Google services are designed for sharing not archiving. One can add that none of these platforms have ever promised anything else in their user agreements. However, it takes time to archive for the individual user, this is real life experience knowledge. Meanwhile the list of social media platforms closing or deleting data becomes longer and longer: Flickr deleting photos in 2019, if you do not go “pro” and pay. MySpace mass delete of old data before 2016, and recently Google+ is in the process of being closed down. Suddenly one wonders, what actually happened to the photos on the Google photo service, Picasa (2002 – 2016) ? – Ok, they were transferred to google photos- relief. What are the reactions to this development? A hint of the positions can be detected browsing through the newspapers and blogs covering the theme. Some show a growing awareness of that the social media data actually reflect our history and if data are deleted, there will be a “black hole” (Shepherd, 2019). Attention on losing important records of contemporary cultural history is also present (Krishna, 2019, Chakrabarti, 2019). Another common reaction from the users is anger, even some are aware of that social media never have promised them long-term preservation. Flickr’s decision has been discussed widely, as in the case of Google+ the changes have been announced beforehand. People though find it too little time to act and experience difficulties, when downloading data. Others also regard the situation as an opportunity to select among the thousands of photos, they have uploaded during the years. When it comes to Myspace quiet a lot of people feel cheated, as there has been no information and Myspace claims that it was a mistake made during migration. Furthermore, thoughts about the “real” reason behind the mass delete flourish. 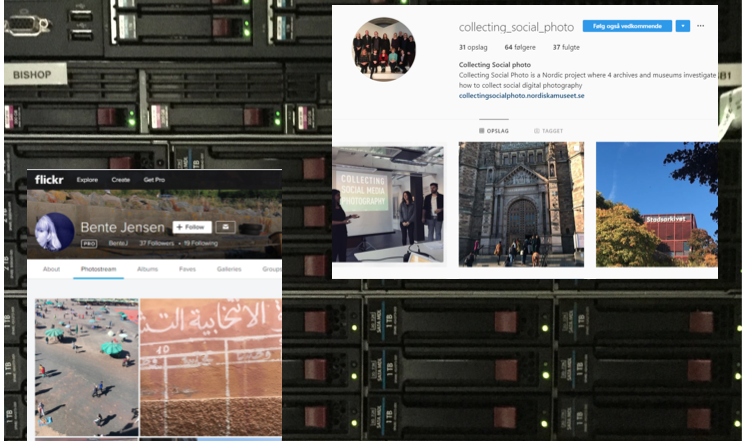 In Cosopho we experiment on how to collect and long-term preserve social media photography through case studies that are aligned with the missions of the participating museums and archives in the project. That implies that we curate and collect in an active manner together with the creators combining qualitative and quantitative methods. The project analyses the practices, motifs, patterns, and the nature of the digital photo shared on social media to obtain a profound basis for collection and selection. During the period of time the Cosopho project has been running, the team has experienced a growing awareness of that social media photography and social media content as such should be regarded as a part of the cultural heritage and it contains records of important activity in an archival sense. The massive use of social media in politics and administration as well as in social movements as e.g. #metoo and #occupynow as well as in reactions to disasters as #openstockholm confirm this. A prominent example of preserving is the president Obama White House Social Media Archives https://archivesocial.com/whitehouse/ . The recent deletes of data on social media platforms actualise the need for collecting strategies in the existing memory institutions for this kind of material, which include social digital photography. Sarah Day Thompson is also among the researchers, who advocates for a strategy on how to ensure long-term preservation of social media content despite difficulties which include ”external dependencies, personal data and individual privacy, ownership, and scalability” (Thompson, 2017 p. 2). Challenges the Cosopho project also have to consider. In her paper (2017) Preserving Social Media: applying principles of digital preservation to social media archiving, she discusses these issues and invites to collaboration between researchers and the heritage institutions among others to ensure that future users will have access to something as meaningful and usable as possible. We only can agree upon the necessity, which we try to address in the cooperation between practitioners from the heritage institutions (museums and archives) and researchers within the Cosopho project.